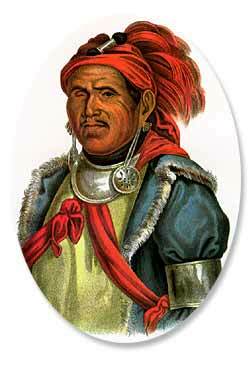 Born in 1778, near present day Springfield, he was given the name Lauliwasikau. He was one of eight children born to an important Shawnee chief. In 1805, he claimed to have a vision. He was told that he should reject the ways of the white man, including liquor, and return to the pure ways of the Indian. He became known as The Prophet or Tenskwatawa. The Prophet shared his vision, encouraging the Indians to return to the ways of their forefathers. He also encouraged peace among the various Indian tribes. The Prophet believed he had power to cure illness and protect Indians from death in battle. He became more famous when he predicted the eclipse of the sun in 1806. Two years later The Prophet and his brother, Tecumseh, started a village on the Wabash River. They named the town Tippecanoe, but it was commonly known as Prophet Town. Many Indians lived there, sharing the dream of one united Indian nation. Tecumseh was away from Prophet Town, recruiting more tribes, and warned his brother not to fight the whites while he was gone. The Prophet chose not to listen and ordered a surprise attack on Harrison's troops that were camped nearby. The troops were ready and easily defeated the Indians at the Battle of Tippecanoe. After his defeat, The Prophet moved to Canada for several years. He returned to Ohio in 1826, eventually being forced to relocate with other Shawnee west of the Mississippi River. The Prophet died in Kansas in 1837.